This Week, a lightweight Reminders client that I first covered in December, was updated to version 1.5 last week and relaunched under a new name: GoodTask. Initially, This Week was a simple iPhone app to view Reminders on a weekly basis, but with time developers at haha interactive added an iPad version and support for more views besides the default weekly one. The new name reflects This Week's evolution in becoming more than a utility to check todos for the current week, and it coincides with the app's new focus on any kind of task – whether it's a reminder or an event in Calendar. In GoodTask 1.5, calendar events can be displayed below reminders, which makes for an interesting presentation, slightly different from what apps like Fantastical and Calendars 5 are offering. Reminders and events are displayed in two different areas of the main view, and they're each color-coded to match the list or calendar they belong to. Thanks to the addition of filters, it's now possible to customize views to show a specific set of reminders and events – in the screenshot shown above, for instance, I customized my Day view to show all dated reminders and events, hiding undated and completed reminders because they're the ones I know I won't have to address on the current day. In the Settings, it's also now possible to enable special lists that collect undated and recurring tasks, making GoodTask a convenient solution to see due tasks and quickly manage the ones that have no date or that repeat over time. I've been following the development of GoodTask since its first version, and I'm enjoying the changes and new features in version 1.5 – I'm especially a fan of the clean presentation provided by the Day view. 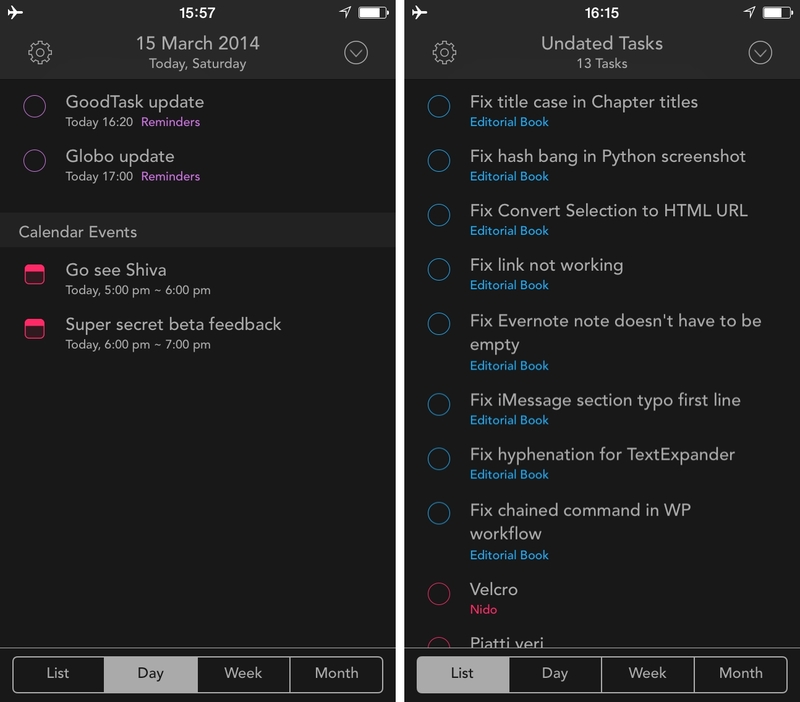 I'm curious to see what's in store for GoodTask, which is available at $4.99 on the App Store.